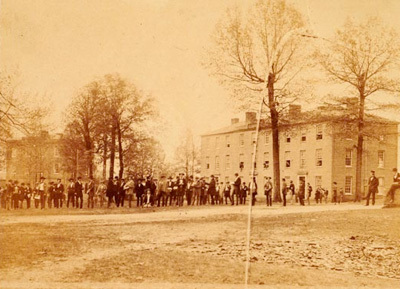 UM established the fourth state-supported law school in the nation (1854) and was one of the first in the nation to offer engineering education (1854). It was one of the first in the South to admit women (1882) and the first to hire a female faculty member (1885). 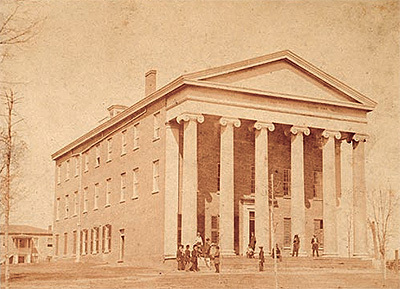 Ole Miss also established the state's first College of Liberal Arts; schools of Law, Engineering, Education and Nursing; accredited School of Business Administration; Graduate School; and accredited bachelor's and master's accountancy programs. It has the only schools of Medicine, Pharmacy, Dentistry and Health Related Professions in Mississippi. From its first class of 80 students, Ole Miss has grown to a doctoral degree-granting university with 15 academic divisions and more than 23,000 students. Located on its main campus in Oxford are the College of Liberal Arts; the schools of Accountancy, Applied Sciences, Business Administration, Education, Engineering, Journalism and New Media, Pharmacy, and Law; and the Graduate School. The Medical Center in Jackson trains professionals in its schools of Medicine, Nursing, Health Related Professions, Dentistry and Graduate Studies. Ole Miss continues to expand academic courses and degree offerings on its regional campuses in Southaven, Tupelo, Grenada and Booneville. In all, more than 100 programs of study offer superior academic experiences that provide each graduate with the background necessary for a lifetime of scholastic, social and professional growth. Strengthening and expanding the academic experience are the Sally McDonnell Barksdale Honors College, Croft Institute for International Studies and Lott Leadership Institute. Recognizing UM's outstanding academic programs, Phi Beta Kappa selected the university in 2001 to shelter a chapter of what is recognized as the nation's oldest and most prestigious undergraduate honor society. UM was the first—and remains the only—public institution of higher education in Mississippi chosen for this honor. Also reflecting the quality education Ole Miss provides, its students regularly are chosen for prestigious scholarships. UM's 25th Rhodes Scholar was named in 2008, and since the Honors College opened in 1998, the university has produced seven Truman, 10 Goldwater and 10 Fulbright scholars, as well as one Marshall, one Gates Cambridge and two Udall scholars. The university admitted its first African-American student, James Meredith, in October 1962 and has worked since to promote inclusiveness in all its endeavors. More than 20 percent of UM students are minorities, and Ole Miss students come from more than 70 countries. The university observed the 50th anniversary of its integration in 2012-2013 with a series of lectures, films, public forums and other events. Learn more about these activities and the university's commitment to diversity. UM's research enterprise—including programs in acoustics, atmospheric physics, health care, remote sensing, Southern studies, space law and pharmaceutical sciences—is renowned internationally. The university holds more than 40 patents for inventions including a fire ant trap, an algal herbicide, novel drug-delivery systems, a thermoacoustic refrigeration device, immune system stimulators and possible treatments for cancer, malaria, pain and infections. This work takes place across the university, which is home to more than 20 major research centers. In addition, the university is a center for Faulkner studies, offering one of the finest collections of the Nobel Prize-winner's work and maintaining his Rowan Oak home as a literary shrine. At the UM Medical Center in Jackson, surgeons performed the world's first human lung (1963) and heart (1964) transplants. Physiologists at the health sciences campus defined the role of the kidneys in controlling blood pressure. The Medical Center is collaborating with Tougaloo College and Jackson State University on the Jackson Heart Study, the world's largest study of cardiovascular risk factors in African-Americans. Four specialized hospitals on the Jackson campus include the only children's hospital in Mississippi, a women and infants' hospital, and a critical care hospital. UMHC offers the state's only level one trauma center, only level three neonatal intensive care nursery and only organ transplant programs.